The National Resistance Movement (NRM) has reportedly given each village party chairperson in Ruhaama County 250,000 shillings for “mobilization” ahead of the parliamentary by-election on Thursday. This publication understands that this money was distributed on Friday at sub county headquarters. The NRM leaders per sub county had been told to report for a meeting with unspecified agenda. “We were surprised when people came and started giving us money. We did not expect to get money. We even don’t know these people who were giving us money,” one of the chairpersons who picked the money told this reporter. There are 386 villages in Ruhaama County. If each party LC 1 chairperson received Uganda shillings 250,000, it means a total of 96.5 million shillings was spent. This does not include money given to parishes and sub county party leaders. There are 114,938 registered voters in 9 sub counties, 3 town councils, and 50 parishes that make up Ruhaama County. The money factor has, however, caused discontent among voters who heard that money was given to their chairpersons who never disbursed it to them. When contacted for a comment, the NRM spokesperson Rodgers Mulindwa dismissed the money claims as a lie. “You could be telling a lie. Where was that? That is news to me. I am not aware of that…I have been in Ruhaama for a week and I came back yesterday. That is news to me,” he said. Mulindwa says NRM will win in Ruhaama with a landslide. “People are voting services; people have seen services in their areas. When you go to Ruhaama, you will see electricity polls all over. People know that NRM government has delivered in their areas. They will vote NRM for continuity and stable service delivery,” Mulindwa says. President Museveni is today expected in Ruhaama County, to campaign for the National Resistance Movement (NRM) candidate, Kahima Moses Mugabe. Today is the last campaigning day. Mugabe is vying for the seat together with independent candidates; Eng Jackson Kabeikire Mubangizi, Orishaba Vastin and Beinomugisha Penninah Jambo. Eng Mubangizi came second in the mid-December NRM party primaries but decided to remain in the race as an independent candidate. 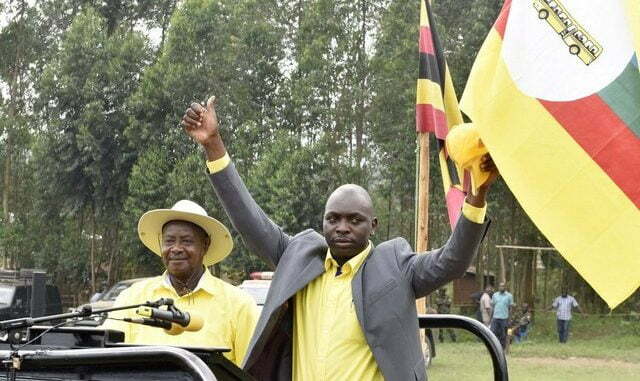 The Ruhaama County Parliamentary seat fell vacant after the death of area MP Beijukye William Zinkuratire, a member of the ruling National Resistance Movement (NRM) party. Zinkuratire who succeeded Janet Museveni in 2016 died in November last year.